CONWAY, NH (June 14, 2017) – During the 2016-17 winter season, total ski resort visits for Ski NH’s 34 ski area members reached 2,357,609, which includes alpine and Nordic skiing, snowboarding, and tubing. This represents and increase of 33% over the prior year’s visits. Alpine skier and rider visits totaled 2,104,298 – nearly 30 percent higher than last season, while total cross-country skier visits were up 80 percent to 133,621. Snow tubing visits hit 119,690, which is the third best year since Ski NH started keeping records, 20 years ago. Tubing saw an 82 percent jump over the previous season. Ski NH announced the final numbers for the 2016/17 winter season at its annual conference at the Red Jacket Mountain View Resort in North Conway, NH on Monday, June 12, 2017. Ski NH is the statewide association representing 34 alpine and cross-country resorts in New Hampshire. For more information on ski areas, vacation planning, and updated winter events at Ski NH resorts, call Ski NH at 603.745.9396 or visit the Ski NH website at SkiNH.com. For statewide travel info, go to visitNH.gov. Mt Washington Valley, Mt. Washington Valley Business, Skiing in Mt. Washington Valley, Winter Fun! CONWAY, NH (April 24, 2017)-As the weather warms and the chairlifts stop spinning for the 2016/17 season, Ski New Hampshire’s 34 ski area members reported a successful season overall, thanks in part to well-timed snow storms in the Granite State and the greater Boston area. Though final numbers are still rolling in from the trade association’s member resorts, a consistent weekly tally of skier visits from 10 of the state’s alpine resorts shows that skier visits for the 2016/17 season are up 31 percent over last year. Nordic ski areas also saw a much healthier skier visit base than last season. “Winter storms blew through when it really mattered this season: during Christmas vacation, leading up to Presidents’ Weekend and February vacation, and during March for many resorts’ spring events,” says Karolyn Castaldo, Communications and Marketing Manager for Ski New Hampshire. The late season snow storms even allowed some resorts that typically close early to extend their season by a week or two. For those skiers and riders who want to take advantage of great deals in preparation for next season, many resorts are offering season passes for the 2017/18 season at http://www.skinh.com/season-passes at discounted spring sale rates. Deadlines begin on April 30 and will run through early June, depending on the resort. But just because the snow is diminishing doesn’t mean that these resorts will stay dormant for long. A growing number of summer activities are available at these resorts, which typically open on or around Memorial Day Weekend and continue through Columbus Day. Ski NH is the statewide association representing 34 alpine and cross country resorts in New Hampshire. For more information on ski areas, vacation planning, and updated winter events at Ski NH resorts, visit the Ski NH website at www.SkiNH.com. For statewide travel info, visit http://www.visitNH.gov. Events in Mt. Washington Valley, Family Friendly, Fun for Kids, Life in Mt. Washington Valley NH, Mt Washington Valley, Non-Profit News in the Valley, Skiing in Mt. Washington Valley, Valley People, Winter Fun! King Pine Ski Area at Purity Spring Resort is excited to announce the next beneficiary of Cynthia’s Challenge 24-Hour Ski-A-Thon to be held in East Madison, New Hampshire March 17-18, 2017. All funds raised with this year’s event will benefit Sanbornville, New Hampshire’s Faith Holt, an 11-year-old girl living with skeletal dysplasia, seizure disorder and Crane-Heise Syndrome. This year’s goal is to purchase Faith’s family a wheelchair accessible van. Faith was born pre-maturely and spent her first one hundred days in a neonatal intensive care unit. The combination of skeletal dysplasia, seizure disorder and Crane-Heise Syndrome require Faith to wear a soft-shelled helmet because she does not have a cranial cap. Due to multiple surgeries and her daily seizures, she uses a wheelchair for her mobility. Faith is the daughter of Doug Holt, an Air Force Veteran who served in Desert Storm, and sister to older brothers, Sean (19), Devin (16) and Cody (12). Faith’s mother, Stephanie Holt, passed away when she was six-years-old. A wheelchair accessible van would be of incredible assistance to the Holt family to get Faith and his other children to their daily activities and appointments. King Pine asks participants to donate $99 per person for 24 hours of skiing, snowboarding, and fun. This ticket price includes breakfast, lunch, dinner, a T-shirt, games, snacks, and non-alcoholic drinks throughout the night. 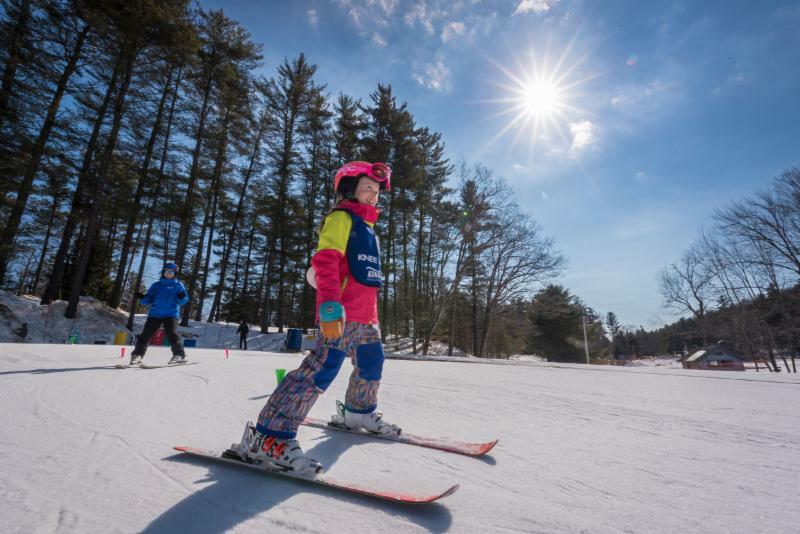 Kids ages 8 and under ski for free. Raffle tickets will also be available to purchase for a chance to win a variety of fabulous prizes, including a Private Duck Tour of Boston donated by Boston Duck Tours, a Valley Train Guest Card for 2 adults and 2 children at the Conway Scenic Railroad, and the grand prize: 3 nights’ lodging in a one bedroom condominium in the Aspens at Jackson Hole Resort Lodging and 2 day lift tickets with Jackson Hole Mountain Resort. Now in its fourth year, Cynthia’s Challenge 24-Hour Ski-A-Thon has raised over $131,000 to benefit children and their families. Starting in 2014, Cynthia Verrill was the first benefactor and resulted in her name being used to name the event. $35,000 raised for Cynthia was used to provide a seizure detecting service dog. The second year, the event raised over $35,000 for Samantha Gillard who was in need of a wheel chair accessible van and the third year raised $61,000 for Kevin Dall to purchase a wheel chair accessible van. For more information about the event, please call Purity Spring Resort at 603-367-8896 or visit https://www.cynthiaschallenge.org/. About The Snow, Adventure in Mt. Washington Valley, Life in Mt. Washington Valley NH, Mt Washington Valley, Skiing in Mt. Washington Valley, What's Your Adventure, Winter Fun! I’m an early riser. There are many benefits to this, not the least of which is beating the crowds to skiing on vacation weeks. This Saturday was no exception. My dear husband and I arrived at the rustic lodge of Bear Notch Ski Touring Center at 9am. Blink and you’ll miss it on your way back from Attitash on Route 302, this Center is run by the Garland brothers and is about as authentic a north country experience as you can get. The Saco runs alongside Bear Notch trails. John Garland greeted us and gave us the lowdown on conditions. “Last week I was cursing the snow there was so much of it. This week it’s inventory,” he chuckled. His groomers had gone out that morning to even out the surface, despite some of the “r” word and warm temps. There was indeed plenty of snow in inventory on the trails. We skied out on their riverside area to see what the rising water levels were doing on the Saco River. There were no ice dams or flooding but the water was running high beside these lovely wooded trails. The trails were tracked for us classic Nordic skiers although trails were also skate groomed. These trails along the Saco River are as beautiful as other more crowded trails at better known local areas. If you are weary of crowded alpine slopes, truly you should consider trying Nordic for weekends that are predicted to be busy. We literally had the trails to ourselves for the 90 minutes we glided through the woods. We only saw civilization when we returned to the lodge post-ski for John’s favorite homemade soup, White Chicken Chili. “You might want to grab some early because it will go fast; I’m going to make a dent in it myself,” Garland shared. Alas, we arrived to early for the fresh bread which comes out of the breadmaker at noon on weekends. Bear Notch is known for their grooming and on the day of our visit, they boasted more groomed trails than a larger area a little further north. In fact the day after our visit, they had 40 groomed km while others didn’t groom at all. It’s a good reminder to always check out the trail report before deciding where to ski. Best of all, trail passes are only $18, meaning a family of 4 can ski and still have money for lunch (that chili was only $4 a cup! ).